At lunch time today, I took my XP Deus metal detector to a large and open grassy area in what is possibly the oldest part of town. 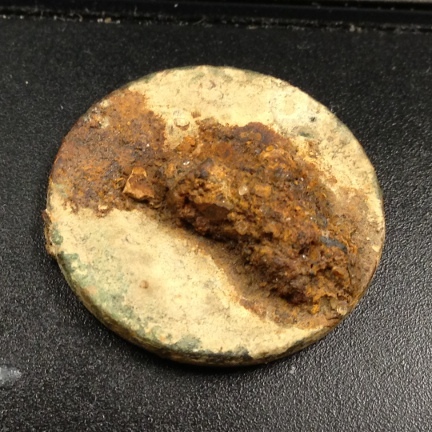 I have thought of hunting this site since I began metal detecting but for some reason I never had. Well today was the day to do it. The temps were hovering in the mid twenties but the sun was out in full and the wind was minimal. When I arrived at the spot, I ran into problems right away. First, there was no place to park. I had to get very creative to park even a block away. Then, I found that the site was trashy. Then the ground was so frozen that I could not get the Lesche even 1/16th of an inch into the ground. Still, I came with the primary goal of establishing if there were structures here some time in the past. None of my resources indicate that anything was ever built here. I have scant information that some sizable human activity took place here way back in the day. It was after looking at maps of the site that it struck me as asymmetrical from a people habitation point of view and so I thought there may have been houses there before. Ultimately I found the evidence I sought. I found old pieces of metal like the kind I’ve found at other 100-plus year old places and I found some melted lead and other amorphous materials indicating that some very old trash or maybe even a house was burned down. Satisfied and knowing I wouldn’t be able to dig anything today, I began my trip back to the car, swinging as I went. Eventually, I hit a spot with many coin signals (in my opinion anyway :)) and one of them was a solid dime signal, which is a 91 VDI on the Deus running Deus Fast with 12KHz frequency. The depth indicated was three to four inches so I decided to try an extraction. 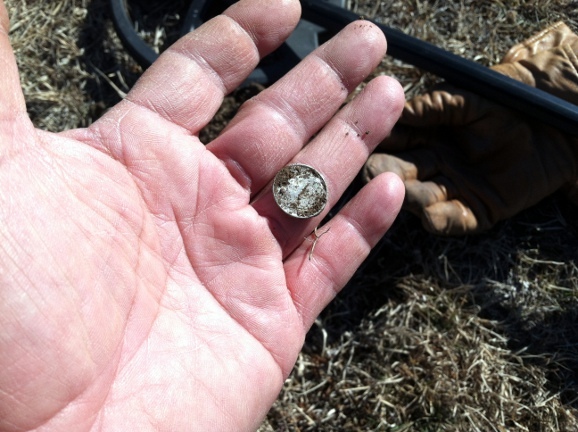 As luck would have it, the ground here had the consistency of hard frozen ice cream, which meant I could slice thin layers of dirt and so after 5 minutes or so, I reached the four inch depth and there it was, shining all pretty like, a 1960 Roosevelt dime. So there it is. 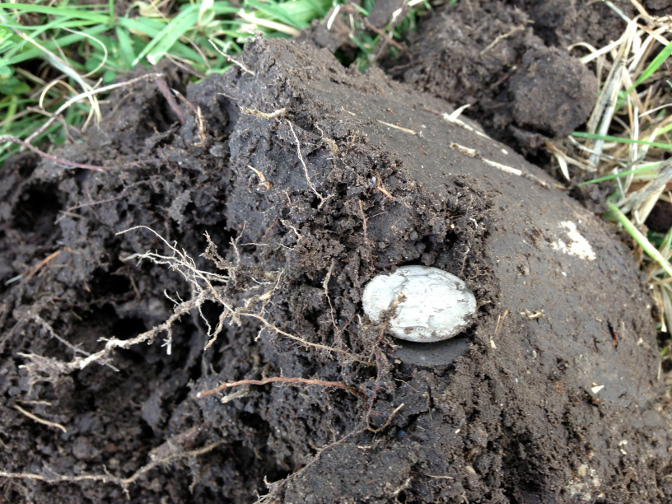 The first silver coin of 2013. 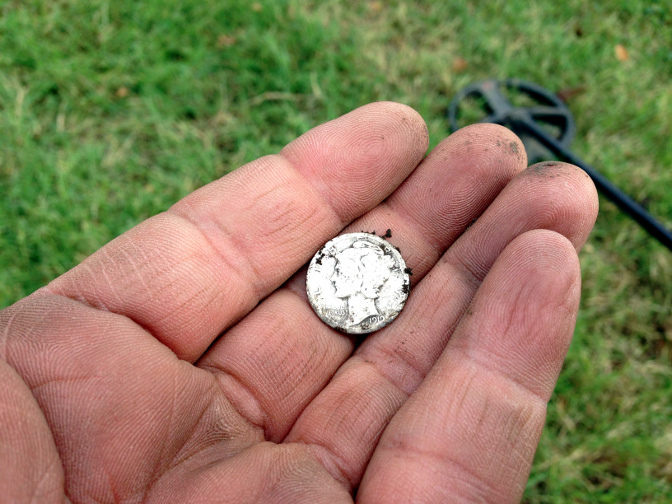 I promise I won’t be so long winded on the next silver coin unless it is a Seated :D.
Last year, it took me two weeks to find the first silver coin of the year and I had to take the day off to find it! 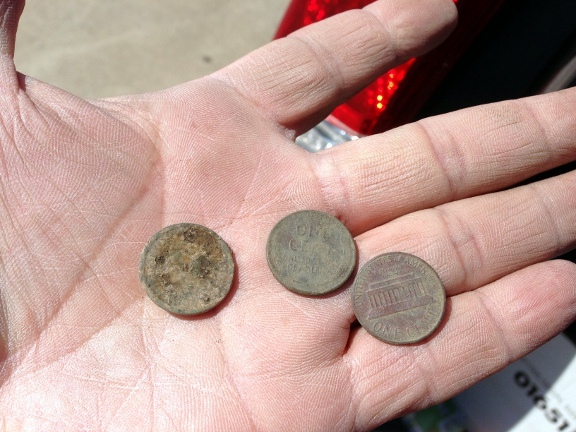 I have a feeling that 2013 will be a good year for silver and gold finds. On this fine End-Of-The-World day, Steveouke invited me to detect a series of empty lots in an industrial area of town. It being a beautiful day and all I grabbed my XP Deus metal detector and headed out to meet him. The first find of note was a 1929 wheat in fine shape. Then I hit my first ever belt-buckle dump. 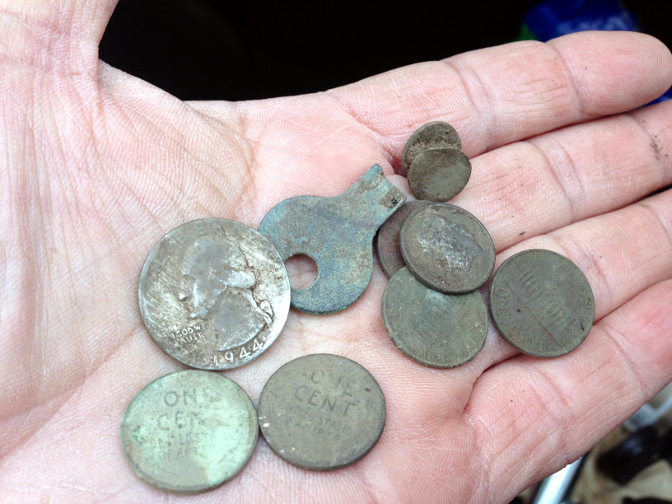 The darn things kept giving really sweet quarter signals so I dug a dozen or so of them before I gave up. I was carrying them around to take a picture but eventually I got tired of them and tossed them in a pile of trash at the back of one of the lots. I then moved towards the front of the lots where Steve was hunting and dug a couple of memorials before finding this beauty at about 6-7 inches deep. It is worth noting that I first pulled a piece of metal trash out of the hole and thinking that it was the source of the signal, covered it. 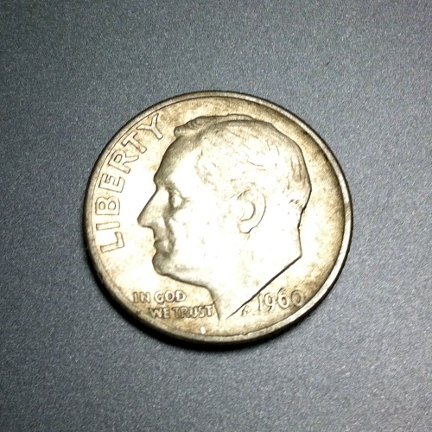 Before moving on, I re-scanned the hole and sure enough, I got the dime signal again. I don’t know if this is the last silver of 2012 because I think Sunday, I am going to hunt a promising location and who knows? My first ever Seated coin could be waiting for me there.